A number of men associated with Kilbride Parish Church answered their country's call during both the First and Second World Wars and enlisted into the armed forces. Most served in the British army or navy but a number who had emigrated from the Kilbride district enlisted in their adopted countries. All served with honour but those listed below made the supreme sacrifice. 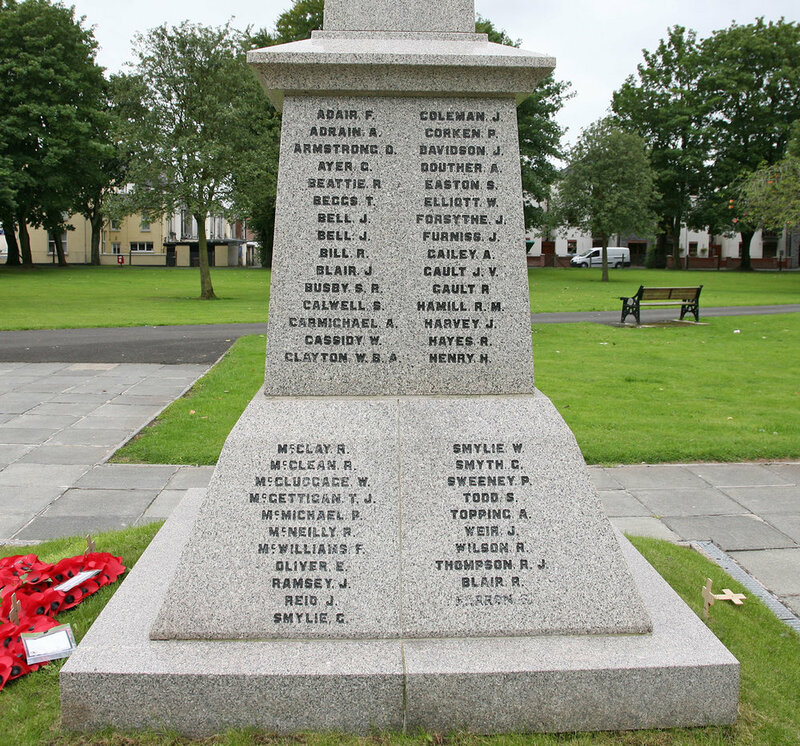 Their names appear on a memorial inside the church as well as on the main memorial for this area in Ballyclare Memorial Park. Information on individual servicemen can be found on the Commonwealth War Graves Commission website where details of each man is recorded, including date of death and place of burial, if known. Many have no known graves but they are commemorated on collective memorials near where they fell. For more detailed information on a particular man (if available) click on the appropriate tab under the main War Memorials tab on the menu above or click on his name below (if underlined). The information will give his military details as well as some genealogical details if available. The sacrifice these men made is remembered on Remembrance Sunday every year when a wreath of poppies is laid at the main memorial inside the church. This tablet was unveiled on 14th December 1919 by Major General Sir William Adair KCB of Loughanmore. Names of the Fallen - for more information on an individual click on his name below (if underlined), or select his name from the list in the tabs above. The second memorial in the church was presented by James and Margaret Gault of Cogry in memory of their son, 2nd Lieutenant John V. Gault. This tablet was unveiled on 5th February 1919. He is also commemorated on the family headstone in Kilbride cemetery adjacent to Kilbride Presbyterian Church on the nearby Moyra Road.